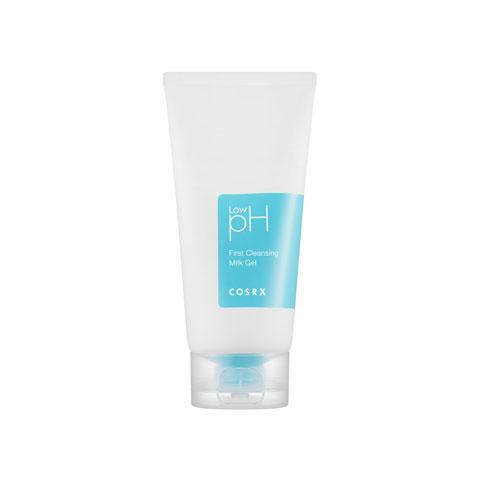 COSRX Low pH First Cleansing Milk Gel is a mildly acidic cleanser. It is designed to be the first cleanse for removal of dirt, sebum, sunscreen and light makeup. This milky gel cleanser has been clinically tested and approved as a low irritant and will also provide moisture to your skin. It has a pH level of 5.5 and is suited for all skin types. Highly recommended for sensitive skin. This gel cleanser has a milky consistency and is mildly acidic (pH level 5.5) to balance your skin’s natural pH level. Formulated with gentle, natural ingredients such as Papaya Extract, Which Hazel Extract and Allantoin, this is a low irritating cleanser. It will cleanse, soothe and moisturise your skin. Witch Hazel Extract – a plant ingredient that is rich in antioxidants, especially tannins. See our entire COSRX skincare range here. To be used as the first cleanse. Squeeze an appropriate amount of product onto your hands. Gently massage the product over your entire dry face. Follow with your second cleanse.